These days, many of us sit in front of the computer to work. However, hours of sitting in front of a computer can leave our bodies feeling stiff and tired. Your neck and shoulder ache after hunching over a keyboard, and your legs and back may feel funny from sitting all day, too. 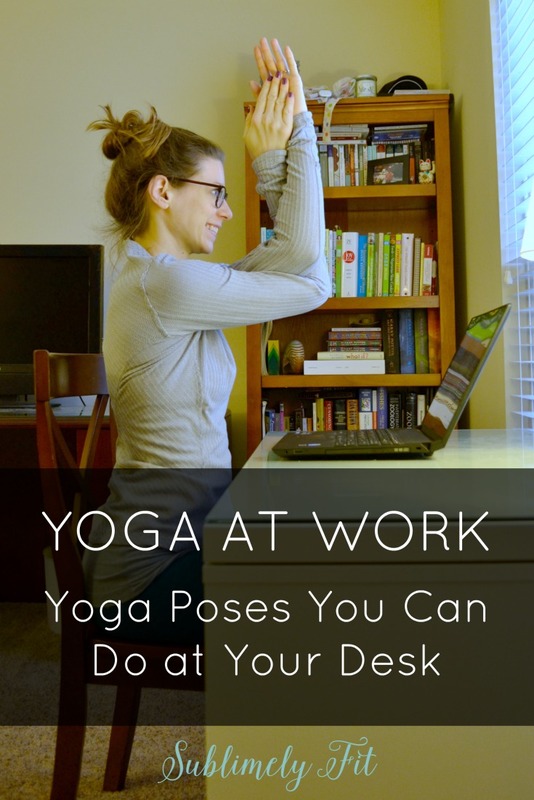 You may not be able to plop down a yoga mat behind your desk to practice a few poses to loosen up, so here are some great yoga pose variations that you can do at your desk, making it easier to help you practice yoga at work. Disclaimer: I am a yoga teacher, but I’m not your yoga teacher. Always listen to your body and if a pose doesn’t feel right, don’t do it. Consult your yoga teacher if you have questions about any yoga poses and how to perform them safely in your body. These aren’t technically yoga poses, but often we begin to warm up our bodies before yoga practice with some simple movements to improve neck and shoulder mobility. So, why not start yoga at work with the same mobility exercises? Start with some simple shoulder rolls, rolling your shoulders back in circles for about 30 seconds, then forward for about 30 seconds. Next roll your head in a big, slow circle, allowing it to fall to the right, down, left, and back several times. Do this slowly so you don’t get dizzy. Then reverse directions. For some additional help stretching the neck (only if you don’t have neck injuries), let your right ear fall to your right shoulder, then place your right hand on top of the left side of your head. Don’t pull down, but simply allow the weight of your hand resting on top of your head to help deepen the stretch. Hold here for a few breaths, then switch sides. Facing your desk, move your chair back so when you sit you’re about arms’ distance away from your desk. 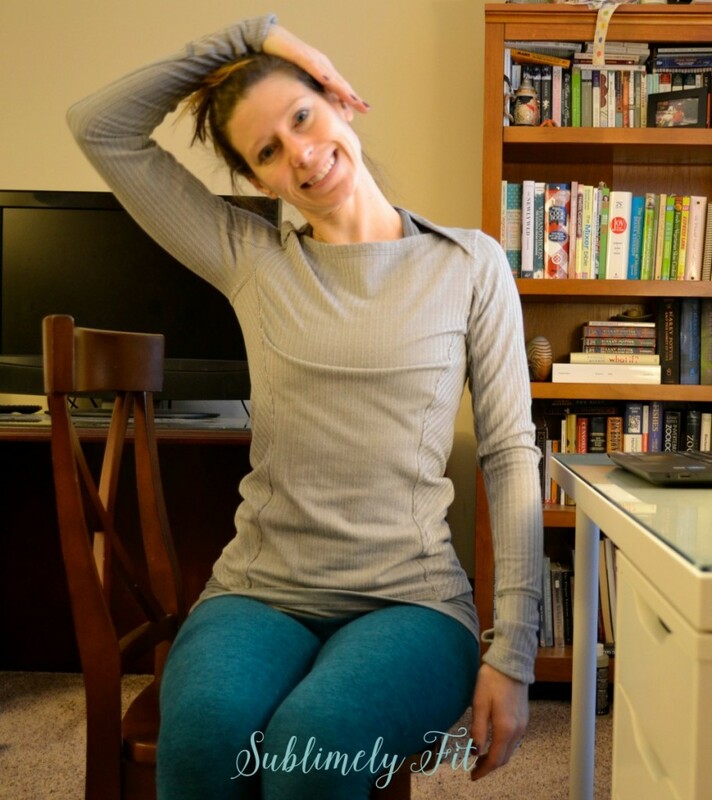 Place your hands shoulder width apart on your desk, then slide your arms forward, keeping your ears between your arms and engaging the muscles in your core to keep your back flat. Pull your heart toward the ground. You should feel a nice stretch through the shoulders. 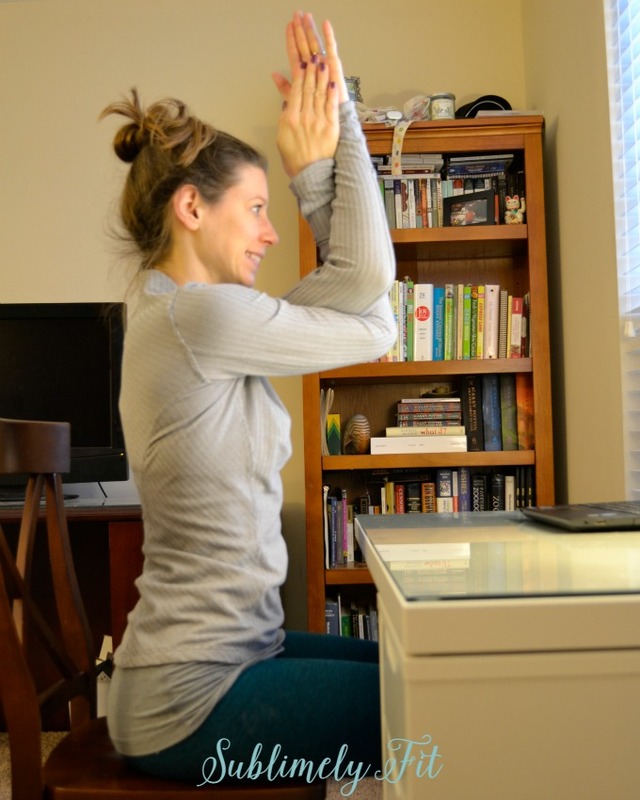 Eagle arms while seated is another great yoga at work option. Skip this one if your shoulders are tight or if the pose feels uncomfortable. Cross one upper arm under the other, then cross your wrists and bring your palms to touch. (For example, bring your right arm under your left, crossing your right wrist in front of the left wrist, bringing your palms together, right palm on the right side, left palm on the left side.) For an extra stretch, press your fingertips up toward the ceiling. You should feel a stretch in your shoulders. To help pull your shoulders back after a day hunching over a computer, try opening your heart. (Note: DO NOT try these poses if you have a shoulder injury! Talk to your yoga teacher for safe modifications for your injury.) If your shoulders are fairly open, you may be able to take a full bind and fold forward over your legs. 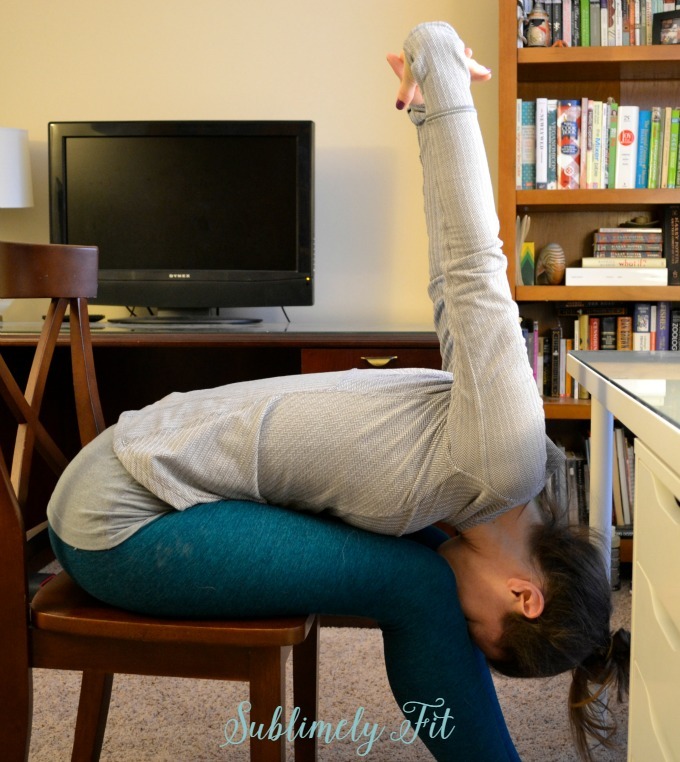 Clasp your hands behind your low back, then bring your heart toward your thighs, folding over. As you do, let your hands fall over your head, letting your head hang heavy to release tension in your neck. If your shoulders are too tight to take the bind behind your back, simply sit at the edge of your chair, then reach back and grab onto the edges your chair close to where the seat meets the back of the chair. Lean forward, pulling your heart through your shoulders as you do. This pose will stretch the same muscles. This is a seated modification of Figure 4 or Standing Pigeon or Reclined Pigeon Pose, helping you stretch the muscles in the outer hip. Plant your left foot solidly into the ground, then cross your right ankle over your left leg, on the thigh just above the knee. Flex your right foot. You should feel a stretch in the outside of your right hip. If your hips are very open, you may need to fold over, bringing your heart toward your thighs for a stretch. Do you ever practice yoga at work? 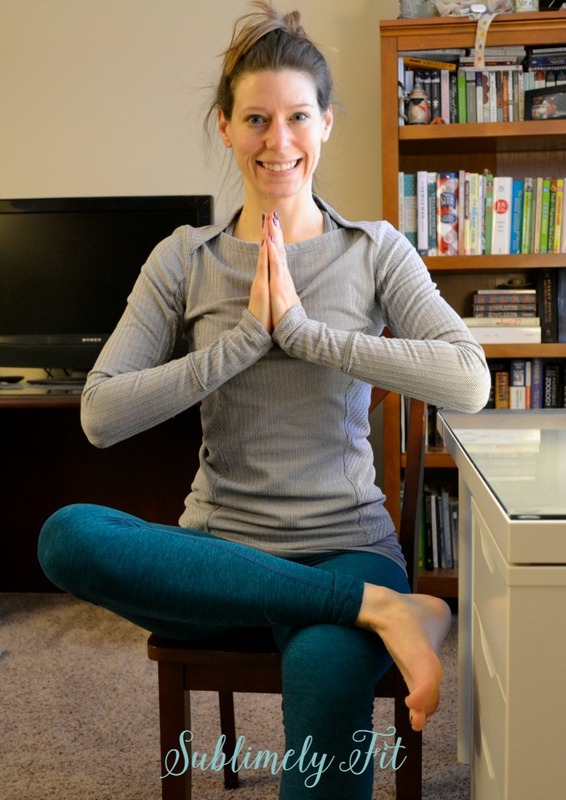 What are your favorite yoga at work poses? I needed these, Beth – thanks for sharing! I was totally guilty in grad school of doing yoga poses in the office after being stuck at a desk all day. I just shifted now into a Figure 4 stretch at my home desk and it feels so good! Love this! I need to take more little wellness breaks at work – this sounds like a great way to do it!